After making a superb start on Sunday, leading the fleet away from Marstrand, it all went horribly wrong for Bouwe Bekking and TELEFONICA BLUE. Since the grounding, Bekking has had to watch the rest fleet sail away to the finish in Stockholm and watch as the battle for second place overall slips further from his grasp. 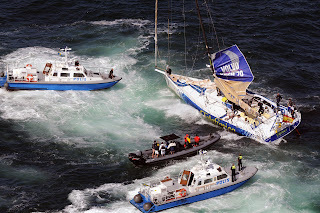 photo credit: Dave Kneale/Volvo Ocean Race.Telefonica Blue run aground the start of leg 9 from Marstrand to StockholmThey hit rocks while racing at approximately 14 knots of boatspeed. After 2 hours of attempts by pilot boats and the coastguard, the boat was finally freed and has made its way back to Marstrand for a full inspection. Whilst waiting for the repairs to his boat, Bekking takes time-out to reflect on the situation. "Still suffering from a terrible hangover. Not because of the booze, but due to the mishap on Sunday. I won't go into the details. By now, you all should know what happened. We made a dreadful, costly mistake and I am the first to admit that it shouldn't have happened at this level. But it did, and that shows that we are still human beings. The fight with Puma was on and in such circumstances you want to gain every metre of advantage. We just cut it too close. You can only guess what went through my mind, not just immediately after we grounded, but the entire afternoon. It was like a very bad dream, which kept recurring every second. I have said this already, but it is worth repeating. We are extremely grateful to the Swedish pilot, coastguard and local police for their assistance. A special thanks also goes to Kimo, Coxi, Shaun and Will from the Puma team, who were out on a chase boat and did not leave our side until were we back in the harbour, even taking over the towing ropes to the big vessel. Thank you guys. We are in direct competition for 2nd place overall with your team, but you showed great sportsmanship and friendship by helping us. Puma was not the only the only team standing by us. Richard Brisius, of Ericsson, got in contact with our CEO Pedro Campos straightaway and offered the use of their work container, with all its boat building equipment. This has been handy as you can imagine.Of course, we had created ourselves a logistical nightmare. 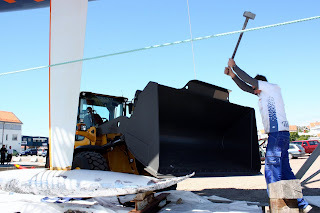 We were taking on water, so once off the rock our next issue was securing the right size of crane to lift the boat and to keep it suspended until we could get the cradle from Stockholm. Campbell showed initiative in ordering our shore crew to come over from Stockholm as soon as possible, tracking down our spare daggerboard and rudder aswell. A structural engineer from the Farr office in Annapolis jumped on a plane to help with the inspection. Last but not least, we were lucky with accommodation, just managing to snap up the last rooms on the island. First indications are very good. Actually I'm amazed how little structural damage we have suffered. One daggerboard case is destroyed, along with a bulkhead as result of the daggerboard pushing back after the impact. A winch has gone; torn off the deck during an attempt to pull us of the rock, which actually has a name. A literal translation is Coppernail. Maybe they should it rename it 'Blue Nightmare'. Well, as I would expect, the guys have got stuck into it and we are receiving huge help from the locals with everything. The racing crew is trying to help the shore team as much as possible, but sometimes it is better just step aside and let the specialists do their job. The plan is to be in Stockholm in time for the inport race, next Sunday, which means trying to finish the leg as well. The pressure is on. I have confidence in the shore crew; I know they are the best and will pull us through this. And, so despite the most awful hangover, there is light on the horizon. The team spirit, of which I am so proud, has risen above our problems yet again. We all stand or fall by our decisions, yet we are fighters and survivors, and, giving in is not an option. P.S.- We want to do everything in our power..."